Hello everyone, Mad Dashiell here and thanks for joining us as Deniz Camp swings open the door to MAXWELL'S DEMONS! Aside from talking about his new comic Mr. Camp also gives us a little insight into his own backstory while also giving thanks to the people that stand by him on his life's journey. Mad Dashiell: Thanks for joining us, its great to have you, so how long have you been working on comics? Deniz Camp: I’ve had a slightly non-traditional path, but I guess there is no traditional path in comics! After med school I really needed a change so I went to Istanbul, Turkey to work in a hospital there and help protest against the government (well, that wasn’t the purpose of the trip, but it ended up being a pretty decent part of my life there). After a year I decided once and for all that I wasn’t happy with my life as it was and made the decision to change it. I moved to New York City with no job and no money and not even a dream, yet. But I had friends, really great friends, and while there were a rough few months in there I decided I wanted to pursue a passion of mine — comics. I’ve always loved comics, always found myself in those pages, and I thought writing them might be something I loved doing. Turned out to be true! I wrote a few scripts and, well, they were decidedly Not Good, which was very disheartening. But they got better as I went. I managed to connect with a couple of artists who were willing to draw some short stories and got some practice that way. Then in 2015 Mark Millar hosted a Talent Hunt for the first time. I had been posting on the Millarworld message board since I was in high school so it seemed perfectly natural and fitting to enter. I ended up winning for my Starlight short story, which was subsequently published in the 2016 Millarworld Annual. I guess that’s my official origin story, my first published work outside of academia. I owe a lot to Mark, who has been a brilliant mentor and friend. MD: As a massive Mark Millar fan. Can you tell the readers any more about Millar's mentorship? DC: Beyond the mere fact of choosing my script, paying me for the work, allowing me to be a part of the Millarworld universe and publishing it through Image — we’ve talked story and approach, he’s reviewed my pitches and pages for pitches, he’s introduced me to editors and just generally been extremely supportive and enthused. He’s even let me make suggestions about artists to work with on his upcoming projects, stuff like that. -Also, he's paid for my alcohol on a couple of occasions, for which I am eternally grateful. MD: Let's back up a bit, can you tell us more about your time in Turkey? DC: Something very, very awful happened towards the end of med school and forced me to reassess what was important to me, and what kind of person I was going to be. I needed a change but was convinced by a few not to give up on my career in medicine. My father is Turkish and he’s the only one of his family that left Istanbul. We used to visit every other summer, more or less, but I never really got to know them, or the country. So a happy medium was that I’d go there, do work in an American hospital, improve my Turkish and really get to know my family. This was in the midst of mass protests and unrest against the increasingly authoritarian government in turkey. I was living in the heart of the city and there were protests every day — sometimes they would tear gas us, or bring in the water-canon tanks. There were many nights you couldn’t go visit your friend for the clouds of tear gas drifting over the main streets. There was a lot of camaraderies to be found in the struggle, is the truth. It felt good to be a part of something. A year later Ferguson would happen in the States and I’d watch in shock as history repeated itself on another continent. The parallels were eerie — Turks were giving advice on how best to utilize twitter or deal with the tear gas. During my time there the civil war in Syria was raging, still more than a year before the west was aware of the refugee crisis. But in Turkey we were aware — I remember vividly each day seeing more homeless on the streets, and none of them spoke Turkish. I’d talk to them in English (their English was often excellent) and listen to their stories and try to help as best as I could with health stuff. The sheer immensity of the loss is still incomprehensible to me. There is a famous picture of a young boy, dead, on a beach in a resort area of Turkey. I’ve been there many times before with my family and with friends. How do you put those things together? Anyway, that’s all to say that my time in Istanbul was very much a time of growing up and listening to and learning from others. But more and more I was discovering that the way of life was not for me, that working in medicine would never make me happy. So I left to go to New York, where I knew some people and hoped to figure out what I was going to do with my life. MD: How would you say your life-changing experiences in Istanbul affected your writing? DC: I really hate it when interviewees quibble with petty details in a question, but — I dislike that term “life-changing”, only insofar as it implies privileged status to any particular experience or period. EVERY period of my life has been life-changing — the wrong turns and dead ends as much as anything else. My life is even now changing every day. That's to say — I’m not sure this period did affect my writing in any way other than I started to writing inside of it. My interests in writing can all be traced back to varying elements of my upbringing. I am the first generation son of a Turk and a Filipina, raised in a small Midwestern college town. We traveled every summer to turkey or the Philippines, our neighbors ran the gamut from 4th generation Michigander to Iranians who came to the states fleeing The Revolution. Even before med school, I spent two years living and volunteering in South America, and that was its own revelation. I have been fortunate to be exposed to many different ways of thinking, of seeing the world, and I think (or hope) I carve that into the body of my work. My time in Turkey was really an extension of that same drive, a universal drive that manifests differently in everyone; to know, and be known. To find a place for yourself in the world. MD: Beautifully put, now let's talk about the genesis of Maxwell's Demons? DC: Sure! 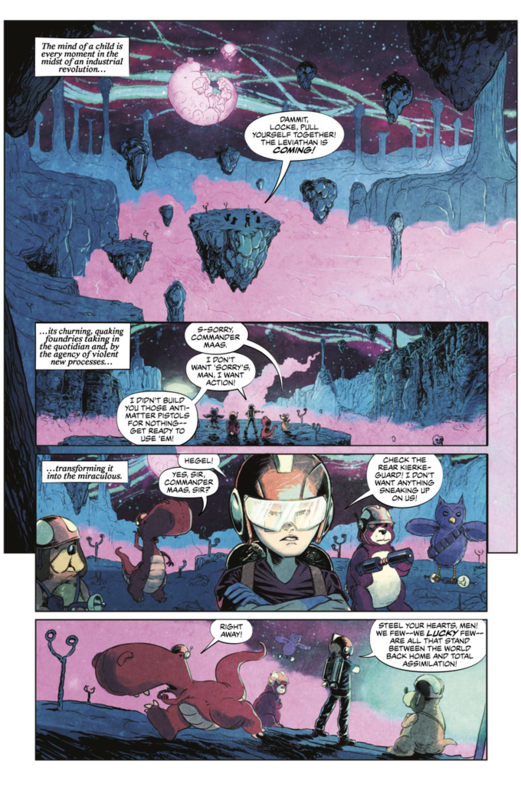 Maxwell’s Demons is my first long-form series (ie, not just a single issue or 10 pages). 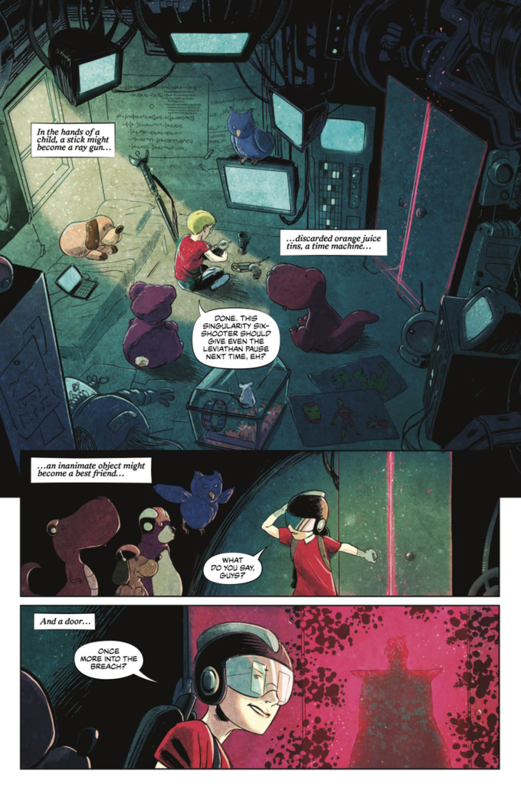 First off: MAXWELL’S DEMONS is science fiction on a massive scale. It follows the story of MAXWELL MAAS, the greatest mind of his generation, and a boy with a great - but uncertain - destiny. We’ll encounter aliens with inscrutable agendas, living worlds held together by love, universes where time runs backward. Through it all, Max will have to use his amazing intelligence to survive a multiverse filled with science fiction horrors and become the man he’s destined to be. In terms of how it came about…it’s hard to say where ideas come from, I guess. 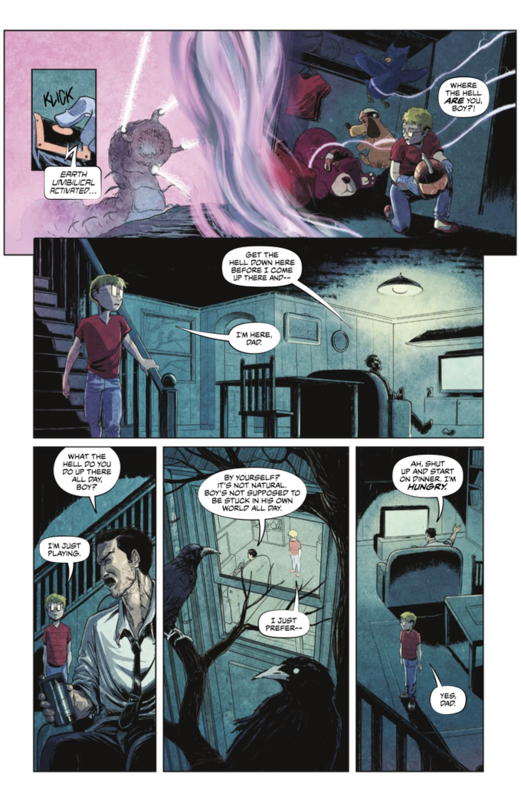 MAXWELL’S DEMONS is very much a hodgepodge of my favorite genre of fiction, my interest in formal storytelling technique as it relates to comics, and my own personal demons and deficiencies. I knew I wanted to make a comic that really took advantage of both the medium and the monthly serial structure (talking about the structure of this book and what we’re attempting to do with it probably deserves its own question). Every medium has its limitations and its potentials. I wouldn’t necessarily want to do a large scale, universe-ending science fiction story as a stage play. And doing it in any other visual medium would be expensive. But all you need in comics is the right idea and the right artists and you can make galaxies explode as easily as having a character eat a sandwich. And this sense of scale has been exploited for decades, becoming part of the DNA of comics; Crisis on Multiple Earths, Secret Wars, Crisis on Infinite Earths, all the work of Grant Morrison, etc. The book has been called “idea rich” and that’s very much a conscious choice on my part: I’ve always felt comics is better with the proposition than the interrogation, at least explicitly. This is kind of wide-ranging science fiction allows me to propose, to entice and invite and provoke. But narrowing down to Max, without getting into too many specifics, I wanted to show a character changing over time, and I thought shining a light on the kind of person who has the capacity to transform not just himself but the whole world with him would be interesting and, again, be fertile ground upon which to build to the scale I wanted to build. MD: Do you have an endgame in mind already for Maxwell's Demons or do you see this going on for a long time from one story arch to the next? DC: Each issue is stand alone, so I’ve come up with 5 “endgames” for the first 5 issues, and then issue 5 begins with a big reveal that recontextualizes the whole series to that point and clarifies what the story has been about. My hope is you’ll go back and read every issue with new eyes after issue 5. My hope is you do that at the end of every issue, actually. But yes, I have a bigger endgame in mind, too. I’ve got about 30-35 issues plotted out for the series, roughly, plots for the individual issues and structured in such a way that each collection or trade would have a special kind of ending that puts a bow on that ‘arc’. But yeah, if we have the opportunity, I’ve got an ending for the series in mind that is about as big and weird and heartbreaking as you can get. MD: What made you decide to use the term Maxwell's Demons for your title? DC: His name is Max, and he’s got demons! Evocation is the name of the title game as I see it. “Maxwell’s Demon” is a very famous thought experiment in physics that deals with the universe’s tendency towards entropy, and proposes how one might thwart it. Without giving too much of the book away, these are themes that lay heavily over the characters and the book. This is a science fiction book that is very much about trying to build something in the shadow cast over all creation, so a physicist’s thought experiment seemed a perfect place to begin. Secondarily (and more obviously) our main character is named Max, or Maxwell, and without giving anything away, he is not a normal boy with normal problems…or normal solutions to those problems. He’s got demons. We all do. His might consume him. If he doesn’t consume them first. MD: Tell us a little about your creative team for Maxwell's Demons? DC: Vittorio Astone handles the lines and the colors. 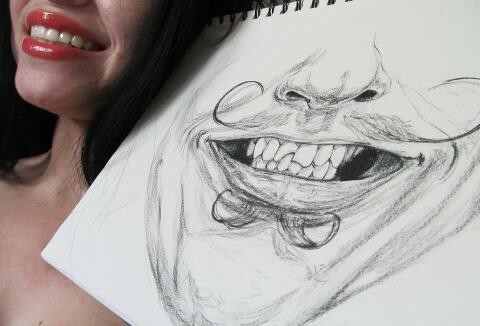 He’s an amazingly talented, mercurial jack of all trades who can literally draw anything I throw at him. The nature of the book’s structure is such that Vittorio has to re-invent the world and even our main character every issue. It would be prohibitively expensive to do this in film or television (not to mention the array of actors you’d have to find all playing the same character at different ages! ), and it’s genuinely difficult for any comic artist. 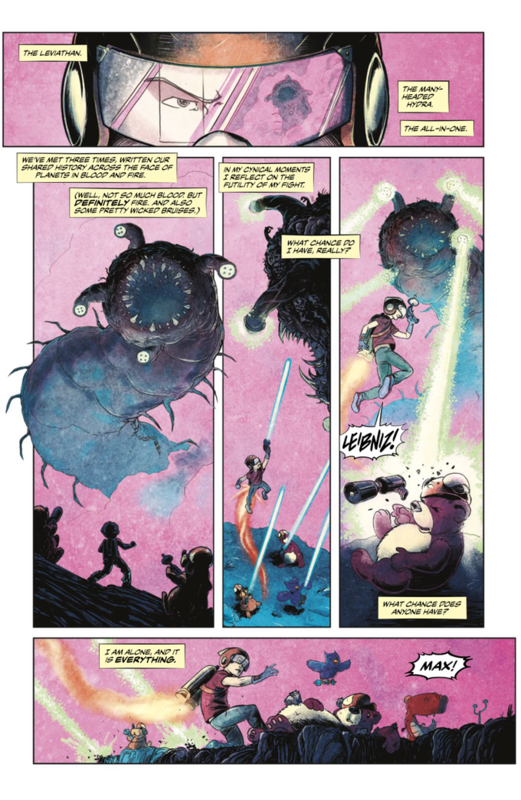 I only felt comfortable with the idea when I saw what Vittorio had done with issue 1, how capable and enthusiastic he was about all the strange things I asked him to dream up. The fact that he’s coloring himself means we can take some storytelling risks that might be more difficult to pull off with a more fragmented team, and we really try to experiment in our later issues. Aditya Bidikar brings letters to the book, breathing life into it. Lettering is art, it’s storytelling, it’s creative — and Aditya is, for my money, the best in the business right now, the spiritual successor to Todd Klein. I’ve asked a lot of him, very strange and particular stylistic choices, and he not only executes, he brings his own strange mind to the process, adding touches and details even *I* don’t spot on my first or second reads. They are wonders and I feel so lucky to have them as creative partners on this book. It wouldn’t be anything without them. MD: Tell us about the comics that inspire you? 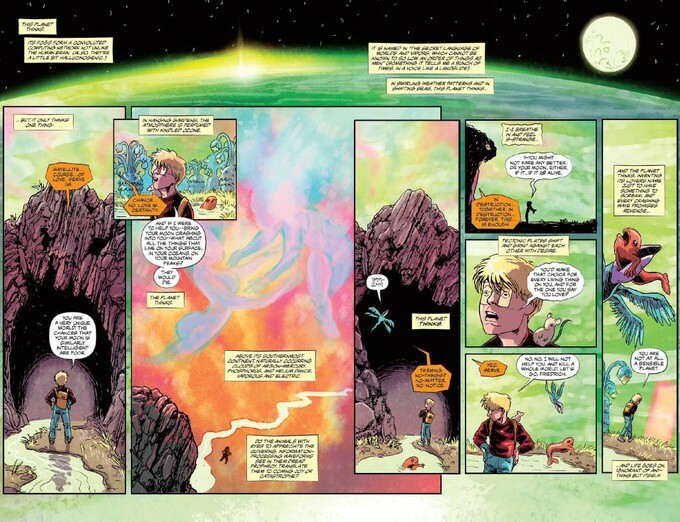 DC: Most directly, on Maxwell’s Demons, the work of Morrison, Moore, Gaiman, Ellis and Hickman. Comics like Sandman, Invisibles, Doom Patrol, Swamp Thing, Promethea, etc were influential on me as a creator in general but are especially relevant to this book in particular. But more generally, I try to find something to be inspired by in everything. I’ve learned a lot about writing from reading everything I can get my hands on — to make any comic takes a lot of work and a lot of thought, and the evidence is right there in front of you. I sit at the feet of everyone who makes comics. MD: What comics are you looking forward to seeing come out soon? DC: Hmmm…I have a bunch of friends doing a bunch of things I’m not allowed to talk about, but I’m excited for those! I’d hate to make a list because I know I’d leave too much out. There’s something for everyone right now. That said, the return of my friend Brett Lewis to comics - writer/co-creator of Winter Men - is something we should all be excited about. Trust me, what he’s got coming is amazing. MD: Is there anything else you would like to share with the AICN readers in closing? DC: I genuinely think we are doing something very rare and very ambitious with Maxwell’s Demons. each issue is self-contained, and they are not arranged chronologically but emotionally. But we’ve threaded narratives between and across them. We’re dusting off formal tricks that aren’t often used and inventing some new ones, making a comic that uses the medium and the format to its fullest. If you think you know where we’re going, I promise you that you are wrong. 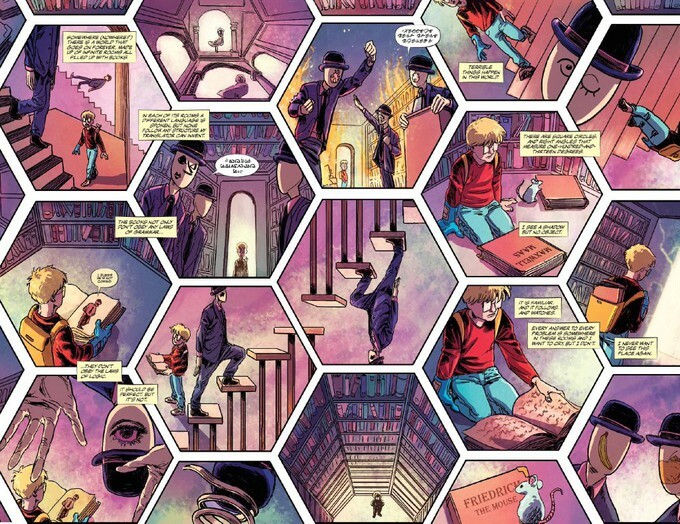 In the first five issues, we reveal the truth about time, the secret origin of Barnes, and the structure of history. And that’s just the beginning! But to do more we’ll need YOUR support, so please give us a shot! 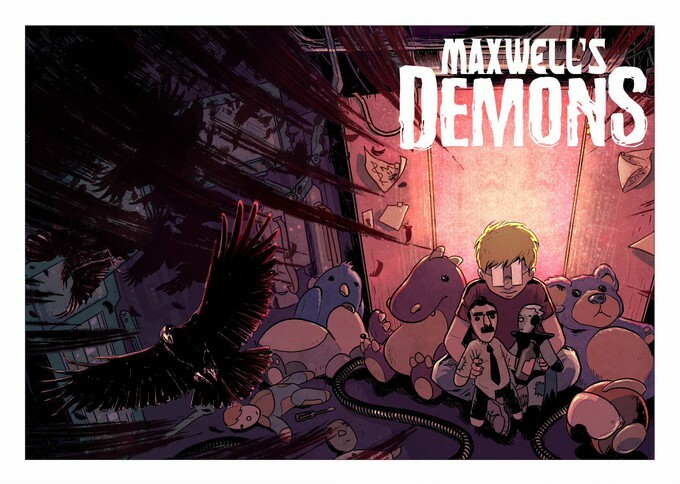 Maxwell’s Demons vol 1 will be out in comic shops July 18th! MD: This has been Deniz Camp and thanks again for joining Me and the folks at AICN. I'm already looking forward to having you back in the future thanks again for the fantastic chat, best of luck to you! DC: Hey that's down to you man! Thanks for asking serious questions. Don't usually get asked about that sort of stuff in comics. Mad Dashiells Space For Rant- I have wanted to get Deniz Camp in here since I cracked open my Free Comicbook Day copy of MAXWELL'S DEMONS. The comic explores escapism, depression, and eating your demons before they eat you along the way to the void with an atmosphere of Spaceman Spiff meets Rick and Morty. Maxwell Maas may truly be the greatest mind the world has ever known, but as a 10-years-old he still has a lot to learn. Adventuring to distant worlds through his makeshift multiversal closet door, Max will encounter both greatness and a growing menace on a cosmic scale. Fans of Niel Gaiman’s Sandman series will feel right at home in the expansive, daring universe of MAXWELL'S DEMONS. I would like to remind readers that if you have a comic project on Kickstarter or already up and going then shoot me a link on Twitter. Thanks for joining me today readers, until next time comic fans this is Mad Dashiell signing off.